In the News – ANTHONY AQUAN-ASSEE, M.Ed., B.Ed., B.Sc. 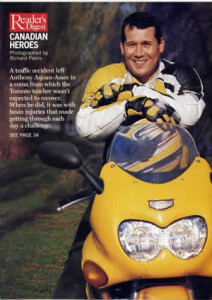 In 1997, Anthony Aquan-Assee suffered life-threatening injuries in a motorcycle accident. Not expected to live, Aquan-Assee defied his prognosis and recovered. He lives with a Traumatic Brain Injury, but with help from his family and through his sheer determination and support from the medical community, Aquan-Assee has gone on to have a life in which he not only thrives, but gives back to those who have had similar experiences. He decided he wanted to share his gratitude through volunteering to help others like him. Every Saturday, you’ll find the Mimico area resident at St. Michael’s Hospital volunteering in its Neuro Trauma Intensive Care Unit – the very same unit where he was a patient. 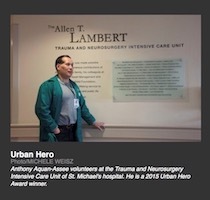 Patients, families, survivors and health-care professionals involved in the neuro trauma intensive care unit are all impacted by Aquan-Assee’s dedication and support, and benefit from his first-hand knowledge of being a patient himself. He has been a volunteer there since 1999, not long after his accident. Many families hear of Aquan-Assee’s accident and ask him to share his story with them. By doing so, he provides patients with unimaginable hope. It’s often he shares long-lasting bonds with patients. Aquan-Assee also shares his story of survival and success through writing books. The world is full of gurus. There is a motivational speaker on every corner. They have their place in a free country. But mostly the only dues they’ve paid are their private jet licence fee and their lobster dinner tab. Mr. A, as the kids at Fern Avenue Public School call him, has paid his dues. “I wouldn’t change a thing,” he tells me over coffee on Roncesvalles Ave., near the school. Not the two weeks in a coma? Not the torn aorta? Not the brain surgery, the plastic surgery, the metal plates, the lung surgery? Not the touch of death? The light, the tunnel, all that? Those “difficulties” started six years ago this week. Sept. 23, 1997. He was riding his Suzuki 1100 from Mississauga to Fern Avenue P.S., to his class of special-ed kids and his touch-football practice. A driver turned left when she shouldn’t have, and next thing Aquan-Assee knew he was looking down a tunnel at a very bright light and gazing upon his limp body from above. He was also VSA, vital signs absent. No pulse. “Critical condition,” said our brief story. He was 28. He was a goner. But here he is, 34. Laughing over coffee. Kibitzing with students. 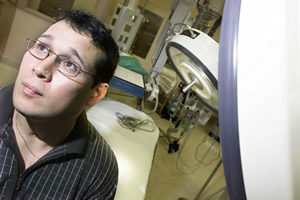 Volunteering in an ICU at St. Mike’s, where he once lay near death, where they gave him a second chance. How he got here is a remarkable story. He tells it in a new self-published book, Second Life, Second Chance. He bears the marks, still. He limps slightly (four knee ops so far). He does not hide his trach scar, or the one that glares from his left elbow. His brain stem was battered, so he’s lucky to get four hours sleep. He has learned to live with perpetual fatigue. Brain injury can be cruelly quirky. Mostly, he forgets things. He pulls out a Palm Pilot. “Everything’s recorded and alarmed,” he says. Staff meetings, school football games, calls to parents, a student’s meds. This interview. He does not dwell, this guy, though Lord knows he has good reason. “My principle now is: Face your fears.” It is what he tells medical conferences, families in ICU, or kids in the yard. So, his west-end condo is a model of precision. If, say, a bill isn’t in its proper place, it doesn’t get paid. He is full-circle to Fern Avenue this fall after a stint at another school. The kids hang off him. He throws pitches, cajoles a boy off a low-slung roof. Mr. A meditates to survive yard duty. Those bounding kids and flying baseballs are hard for a damaged brain to absorb. He brings a rare gift to special ed. His hurdles are akin to learning disabilities. Never give up, he tells his class. “If I can do it, anyone can.” Feel good about yourself. If you can’t do math, you can do something else. He competed in judo before the wreck. He still lifts weights and is built like a brick. He is not especially religious, but now he figures something comes next. Maybe, Mr. A. I know this: Life is what you make of it.